A: Identify where to check level, i.e. dipstick or sight glass. Explain that level should be between max and min marks. For dipstick remove dipstick and wipe clean, return and remove again to check oil level against max/min marks. For sight glass, ensure glass is clean when checking. A: Operate the horn button turning on the ignition (if necessary). A: Handlebars should be free to move smoothly from full left lock to full right lock without any control cables being stretched, trapped or pinched and without any snagging between moving and fixed parts. Any play or uneven movement in the steering head bearings require adjustment or renewal. A: Correct tyre pressure settings can be found in the owner's manual. Pressures should be checked using a reliable gauge. Tread depth must be at least 1mm deep, forming a continuous band at least 3/4 of the breadth of the tread and all the way around. There should be no lumps, bulges cuts or tears. A: Wheel the machine forward and apply the front brake or sit on the machine and apply the rear brake to ensure that they are working. Check for excessive travel on the brake lever and the brake pedal and also for unusual play or sponginess. A: Operate switch without the engine being started. 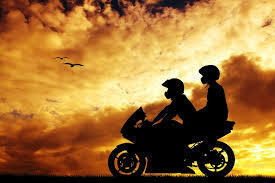 Q: What advice would you give to a pillion passenger who hasn't ridden on a motorcycle before? Tell them to dress appropriately and wear an approved fastened safety helmet. Tell them not to get on or off until instructed to do so. Make sure they get on the motorcycle from the kerb side and sit astride the motorcycle. Put their feet on the foot pegs at all times and hold onto the grab rail, rider's waist or a combination of the two. Don't fidget or move around. Lean with the rider. Don't give any arm signals. Arrange a predetermined signal such as a tap on the shoulder if the pillion wants to stop for any reason. Q: What adjustments would you make to the motorcycle if you were taking a pillion passenger? Lower the rear foot pegs down. Adjust the mirrors after the pillion gets on. Q: How will the extra weight affect the handling of the motorcycle?Accelerating and braking will take longer. Centre of gravity will be raised making the motorcycle top heavy and unstable. At slow speeds the motorcycle is more unstable. The steering may become lighter. At speed the bike will drop into the bend quicker and be harder to lift back up.